Muh truck froze to the ground last night! Filed to: That's a new one!Filed to: That's a new one! I’ve done 17 Chicago winters in 2wd trucks, so I consider four wheel drive a luxury. My first four of those winters were in an S-1o on all season tires (I had no idea snow tires were a thing back then), and it even had an open rear differential. I loved hooning that thing around in the snow, and I only needed assistance twice. It needed one pull out when I buried it up to the frame in a snow-drift, and I once had to have a couple passers by give my a little push to get out of a parking spot that was a giant lumpy sheet of ice. My Sierra has a locking diff, and for the last 6 or 7 years I even started putting snow tires on it. When the weather is nasty, we don’t take my wife’s AWD CX-5 on all seasons, we take my 2wd truck on snow tires. 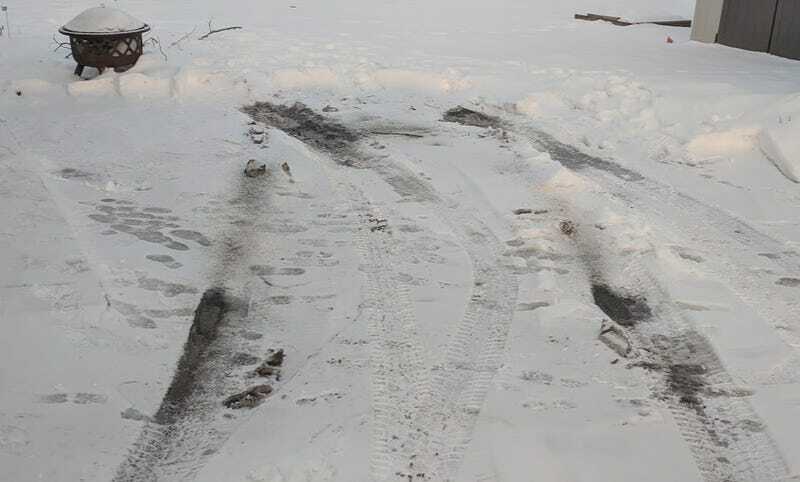 Now, to be honest, I did get it stuck once in very muddy grass when I had those horrible Firsetone Destination LE tires on it (great on dry or wet pavement, worse than Uniroyal Tiger Paws in the snow), but I have never ever needed assistance in snow or ice. So imagine my surprise when I go to leave for school this morning, and my truck will not move one inch. I tried rocking back and forth, nothing. I figured a lump of slush came dislodged and had basically choked one of the front wheels, but nope. That’s when I realized I could not turn the steering wheel either. The slush I had parked in last night had frozen solid when the temperature crashed, and basically glued my front tires to the ground in ice. Fortunately my wife heard me spinning my tires, and came out to help. She tried pushing while I worked the gas, but that didn’t work either. We switched places, and we were able to ease it out. The whole ordeal took five minutes, so it wasn’t a big deal, but yeah, that was unexpected.